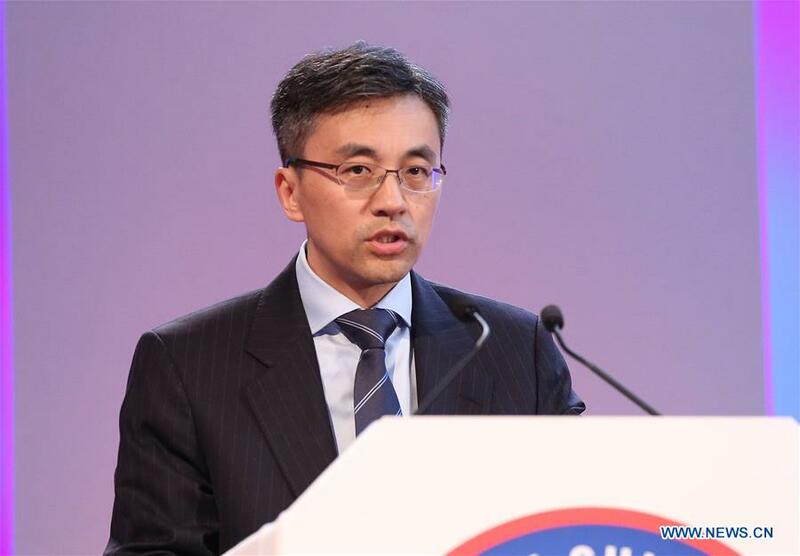 LONDON, June 19 (Xinhua) -- China and Britain need to seize the opportunities to deepen their mutually-beneficial cooperation and shift the China-Britain "Golden Era" into a higher gear, Chinese Charge d'Affaires to Britain Zhu Qin said Tuesday. Zhu made the remark when delivering a keynote speech at the Margaret Thatcher Conference on China and Britain held by the British think tank the Center for Policy Studies (CPS) in London. Recalling that China embarked on the great journey of reform and opening up 40 years ago, Zhu said the policy has brought profound and historic changes both to China and to China's relations with the rest of the world. Zhu said China has entered a new era of building socialism with Chinese characteristics, and Britain is embracing a "global Britain." "This is a time of new and historic opportunities. Our two countries need to seize these opportunities to deepen our mutually-beneficial cooperation and shift the China-UK 'Golden Era' into a higher gear," said the Chinese diplomat. He said the two countries should consolidate the strategic foundation of bilateral relations and take the lead in open and inclusive cooperation. "I believe that, as long as China and the UK follow the international trend of development and progress, and advance our bilateral relations with a strategic vision and political wisdom, we will write a new chapter for China-UK win-win cooperation and take the China-UK 'Golden Era' to a new high," Zhu said. CPS chairman Lord Saatchi said the conference is intended both to examine and to strengthen the relationship between Britain and China. "As our country leaves the European Union, seeking to strike new trade deals with old friends and new allies, China will play a crucial part in that story," he said. CPS Director Robert Colvile said their focus is on maximizing the prosperity of post-Brexit Britain, by making it a place that champions aspiration, enterprise, opportunity and ownership. He believes the nature of Britain's relationship with China, both commercial and political relationship, will do much to shape that future. CPS is a free-market British policy think tank whose goal is to promote coherent and practical public policy. Although identified as non-partisan, the center has strong historical links to the Conservative Party.